George Vancouver was born on June 22, 1757 at King’s Lynn, Norfolk, England, the youngest of five children of John Jasper Vancouver (collector of customs) and his wife Bridget. The story of Cook’s death at Kealakekua Bay, on February 14, 1779, has been often described, but the small part played by midshipman George Vancouver is not widely known. The day before Cook’s death, for the second time in one day, a Hawaiian took some tools from the Discovery and escaped in a canoe. Thomas Edgar, master of the Discovery, and midshipman Vancouver were part of the chase to retrieve the stolen tools – a scuffle later occurred, which included Edgar marooned on a rock close to shore. Vancouver visited Hawaiʻi three times, in 1792, 1793 and 1794. He completed the charting of the Islands begun by Cook and William Bligh. On the first trip, Vancouver’s ships “Discovery” and “Chatham” first rounded the Cape of Good Hope, South Africa, and traveled to Tahiti, via Australia and New Zealand, and then sailed north to the Hawaiian Islands. Arriving off South Point, on March 1, 1792, the Discovery and the Chatham sailed close to the western coast of the island of Hawaiʻi. Later, leaving Kawaihae Bay, Vancouver’s ships made their way past Maui, Kahoʻolawe, Molokaʻi and Lānaʻi, to Oʻahu, anchoring off Waikīkī – they later made their way to Kauaʻi. Vancouver did not seem to have been conscious of disease among the Hawaiian people, but he was aware of the arms trade and interisland warfare and attributed the decrease in the population to the deplorable sale of arms by avaricious European traders to “ambitious and enterprizing chieftains.” (Vancouver, Speakman, HJH) He later left Hawaiʻi and sailed to survey the Northwest coast of the American continent. On the third trip to the islands, arriving in early-January 1794, Vancouver brought three ships, “Discovery,” “Chatham” and “Daedalus.” They headed to Hilo. Shortly after, Kamehameha assembled the principal chiefs from all over the island for a meeting at Kealakekua. There they had a serious discussion of cession. A treaty was discussed that afforded British protection of Hawaiians from unscrupulous traders and predatory foreign powers. It would be achieved through the cession of the Island of Hawaiʻi to Great Britain. Captain George Vancouver died on May 10, 1798 at the age of 40. 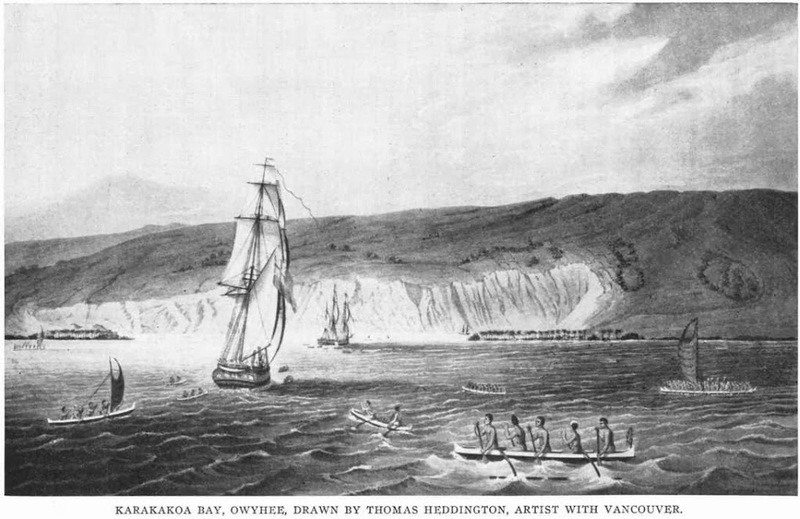 The image shows Captain George Vancouver arriving at Kealakekua Bay. I have added other images to a folder of like name in the Photos section on my Facebook and Google+ pages.